Ketchikan, Alaska - An old-timer once said, "If you want to make it as a miner, keep your needs few and desires simple." Val Klemm kept his needs few but his desires were not simple-just the opposite, in fact. He desired to make money. Born in 1878 he came to Ketchikan in 1904 and built a one-story home in Newtown in 1906. In 1914 he purchased two mining claims at Caamano Point which he developed and worked for the next 34 years. A few old-timers still remember Klemm's antimony mine at Caamano. (In earlier days antimony was used to make paints, enamels, pottery and rubber.) The mine was referred to locally as the "Klemm claims," though the official name included two registered claims: the Hot Air and the Black Hand Lode. The Hot Air was the largest of the two claims with a 12-foot shaft, several open pits, a mill and blacksmith shop. Both claims were located in a small cove on the Clarence Strait side of Caamano at the 200-foot level, about three-quarters of a mile from the beach. At the head of the cove, Klemm built himself a cabin. Known around town as "Sharkey" (because he was a boxer in his youth), Klemm was a big man with a full beard and mustache. 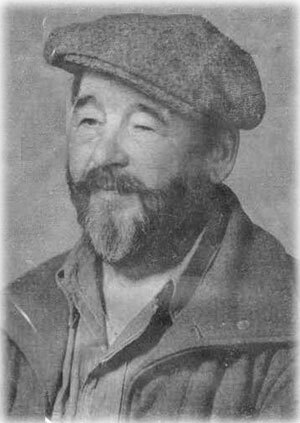 He usually wore a working man's cap, a plaid wool shirt and red suspenders. He worked the mine by himself, packing the ore, load after load, down the trail on his back. By 1926 he had a stockpile of ore on the beach. He shipped a sample to a San Francisco smelter for analysis. The results showed 44.8 percent antimony; this was a promising sign and interested some investors. When the investors arrived at the mine, however, Klemm demanded such a high price-including a nonrefundable cash down payment-that the investors gave up and left. Because the mine revealed the only commercial deposits of antimony in Southeast Alaska, Klemm believed it was worth thousands of dollars and would not sell for less. He continued to work the claims himself, although he found it necessary to indulge in other money-making activity-some of which was legal, some not. He took a job in the plant of the Ketchikan Cold Storage. In the wintertime he trapped wolves for bounty, running his trap line from Paul Island around Caamano Point to the head of Bond Bay. He also worked on cannery boats and tenders. These activities were all legal, of course, but none earned him enough money to continue mining, so he turned to another type of work: robbing fish traps. During this venture, he worked in partnership with his pal and fellow miner Walt McCall aboard the boat Helen H.
In September of 1926, Klemm and McCall got caught while robbing a trap near Caamano Point. They were arrested, tried and convicted. The headline in the Ketchikan Chronicle read: "Verdict is First Ever in Alaska for Fish Piracy." Klemm and McCall became notorious around town and paid dearly for their crime: The judge sentenced them to three years in the federal penitentiary at McNeil Island! When Klemm got out, he returned to Ketchikan and his little house in Newtown. He worked on fishing boats until he had enough money to return to the mine. Then in the fall of 1949 he asked Captain Hans Hanson, owner of the troller Gussie, to transport him and his grub and gear to Caamano for the winter. He requested that Captain Hanson return to pick him up on March 5, 1950. Klemm kept a diary that winter, faithfully recording his daily activities. On February 4, 1950, he wrote that he spent the day shoveling snow. That was the last entry in the diary. When Captain Hanson returned as scheduled on March 5th, he went to Klemm's cabin and found a dead body. Captain Hanson brought Klemm's body back to town where his friends held a small funeral and burial. A coroner's jury determined that Klemm died of a heart attack at the age of 72. In the end, Klemm's Hot Air and Black Hand claims and 34 years of working them earned him nothing. When he died, a local man, George Roberts, purchased the claims for $500. Irl and Abbie Thatcher bought the little house in Newtown for $1500. Bufvers, John. History of Mines and Prospects, Ketchikan District, Juneau, Alaska: 1967. 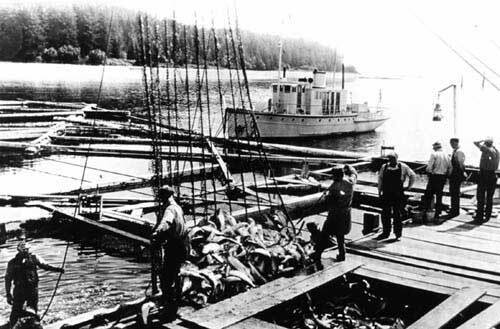 Ketchikan Alaska Chronicle, "Verdict Is First Ever in Alaska for Fish Piracy," Ketchikan Alaska: September 9, 1926. Ketchikan Alaska Chronicle, "15 Trappers Obtain Wolf Permits," Ketchikan, Alaska: November 10, 1942. Roppel, Patricia. Fortunes from the Earth, Sunflower University Press: 1991.